There are three species of newt native to the UK, these are smooth newt, palmate newt and the European Protected Species of great crested newt. Newts hibernate in places such as log piles or amongst the roots of trees during the winter and return to aquatic habitats during the spring to breed. 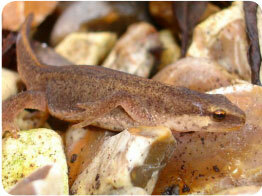 During other times of the year newts use areas such as grassland, woodland and scrub to forage and find shelter. 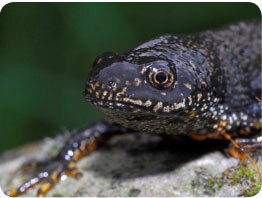 Great crested newts are legally protected not only by the Wildlife and Countryside Act (1981) but also by the Habitat Regulations (1994) due to their scarcity at a European level. This makes it an offence to kill, injure, capture or disturb great crested newts or to damage or destroy their breeding sites or terrestrial habitats. The amphibian survey team at Total Ecology hold all of the necessary licences for carrying out great crested newt surveys and for working with great crested newts in the UK. We approach each case on an individual basis and offer a tailored approach to ensure that development needs, as well as the legal requirements of UK planning applications, are met. The initial risk assessment for GCN is normally carried out as part of a scoping or extended Phase 1 survey but can be carried out as a standalone survey. The survey generally involves assessing all water-bodies within 500m of a development site using a Habitat Suitability Index (HSI). The HSI gives an objective measure of the potential of the water-bodies to support GCN and a good indication of whether further survey work is likely to be required. If the HSI reveals that the water-bodies have potential for supporting GCN then further survey work is required which should be carried out between mid March and mid June. Initially four survey visits are required to determine presence or likely absence and if GCN are discovered then a further two surveys are required to enable a population size estimate to be made. A population size estimate is required in case a European Protected Species licence is needed from Natural England. If a potential habitat is identified then further newt survey work will be necessary, which comprise of four visits to define presence or absence, with a further two newt surveys required to enable a population estimate to be made. A population estimate is necessary if a licence is required to enable the development to proceed. If a licence is required then advice can be provided for an appropriate newt method statement and newt mitigation in order for the development to proceed. All ponds within 500m of the development site should be assessed in order to comply with the regulations and must be assessed during the breeding season, which runs from March to June, so forward planning is important. This involves searching the submerged aquatic vegetation at the edges of ponds for GCN eggs and folded vegetation that may contain eggs. High powered torches are used to locate GCN in ponds after dark, during the breeding season (March-June). This method is the most commonly used, and considered the most reliable way of detecting the presence of newts in a water body. Bottle traps are distributed approximately 2m apart in the water around the perimeter of each pond at dusk. Newts swim or crawl into the traps and are unable to get out. Traps are checked and removed the following morning and the newts released. Ponds are walked at a consistent pace with a long-handled net sweeping a figure eight in the water in front until the whole pond has been covered or at least 15mins of netting per 50m2 has been carried out. The net is periodically checked after 2-3 sweeps for any newts captured, and these are immediately released back into the pond. Will you need a newt licence? If Great Crested Newts are discovered then an EPS licence is likely to be required from Natural England and certain mitigation measures will need to be undertaken, such as fence installation and a period of trapping to clear newts from the site and move them elsewhere, with compensation to replace the habitat lost to development. 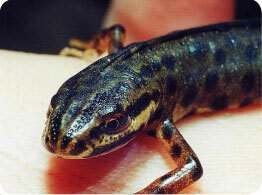 Please contact us for further advice on great crested newt surveys or amphibian surveys.